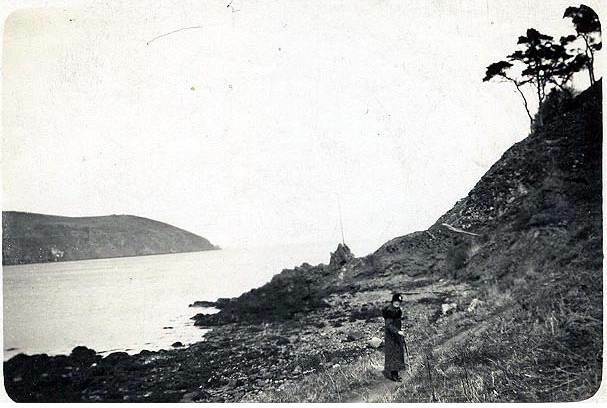 Cromarty Image Library - Shoreline at the targets - c1942?? Shoreline at the targets - c1942?? Mary says:- "The figure shown is my grandmother, Bella Chapman, and I reckon that that the picture may have been taken in the 1940s. Do people still visit the Dripping Cave? Can one still get into it? My recollection is that there was a huge stalagtite at the mouth of the cave that you had to edge round to get in - presumably it will have grown a bit since then..."
I can still get in it! So can I 'just'. It's the 'Drooping Cave' by the way. There was an old story that there was a bigger cavern in the back, but that it had closed up due to the stalagtites. I think actually that it is either or Sue - the Dripping or the Drooping Cave! It certainly is both - we always called it the former - and it surely did drip! "A cave with wells, called the 'dropping cave' at Cromarty, has a demon in its inner recesses". A quote from China and Japan, Myths and Legends, by Donald A Mackenzie.